First outfit pictures after getting better. Felt good to spend the day in the city, out in fresh air. 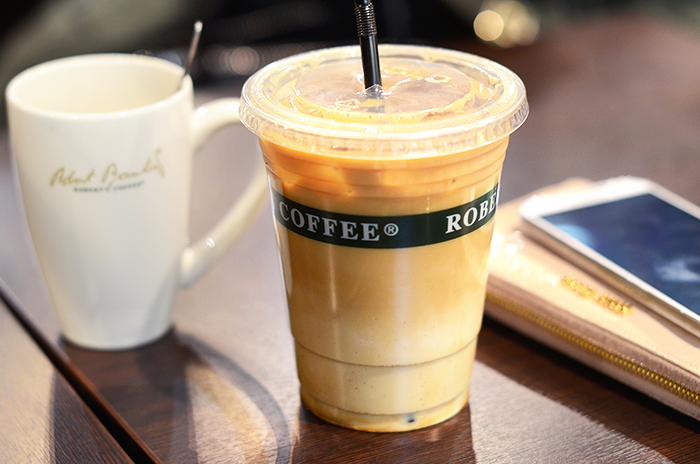 Drink coffee, catch up with everything that has happened during the last week, eat at a favorite cafe, gossip a little bit more, check out a few shops and then after walking and wandering coming home and blogging. Almost a perfect day. Now that I’m over the flu I could probably start going to the gym again, I’ve had a little (a long) pause in that. I just want that to become a routine again, I don’t feel myself as energetic as I could be without it. I need to get into the good mood again, eating well, sleeping well and being active. From experience I know it gets easy if you get through the start, so that’s what I have to do! Ensimmäiset asukuvat tervehtymisen jälkeen. Tuntui hyvältä viettää päivä kaupungilla, raikkaassa ilmassa ja vielä aurinkoisella säällä. Kahvitella, käydä läpi viime viikolla tapahtuneita juttuja, kiertää muutamat pakolliset kaupat, ja kävelyn ja haahuilun jälkeen pyöräillä kotiin ja bloggailla. Täydellinen päivä melkeinpä. Nyt kun alkaa flunssa olla selätetty, voisi salilla käymisen taas aloittaa, siihen on tullut vähän liian pitkä tauko. Haluun Esportilla käymisen taas rutiiniksi, ilman sitä en tunne itseäni niin energiseksi kuin voisin olla. Täytyy muutenkin päästä taas kaikessa hyvään rytmiin, niin nukkumisessa, syömisessä kuin aktiivisena olemisessakin. Mutta eiköhän se ala sujumaan kun vain alkuun pääsee! I loooooove your scarf Marianna! It’s absolutely gorgeous! Love the coat too, such a great look! Darling, you look so perfect! It looks very warm and cozy, as I like! Your winter outfits are always an inspiration! Nice pop of colour from the scarf. Few days ago I bought a similar scarf at Zara. It´s really fluffy and comfy – I love it!! Very cute casual look! Fabulous bag and boots! Aww, you look good! 🙂 Finally you’re feeling better. Is the jacket from this year? Love this outfit! 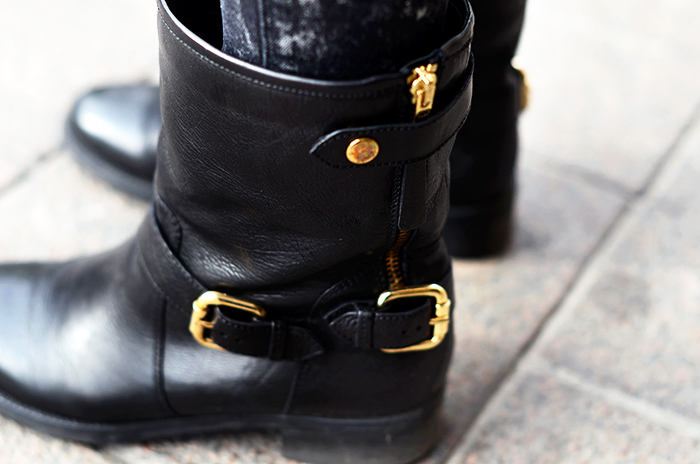 Perfect boots and bag! Love it. I bought a similar jacket last year, also from Zara and it’s so warm. Where are the gloves from? A perfect fall look! Love it! I am in love with checked garments! And this scarf really suits you! Do you bought your jacket this year? Yes, I was wondering the same. I bought it in August, so yes it is this season 🙂 Thanks so much! I hope you’ll find it! Hi Mariannan, your boots are gorgeous. Is YourFace a local store or what is it. I googled it and I couldnt find it. Could you post a link, where I can find these kind of boots? I’ve a crush on your scarf ! You’re gorgeous! I’m just wondering, what do you do for living? 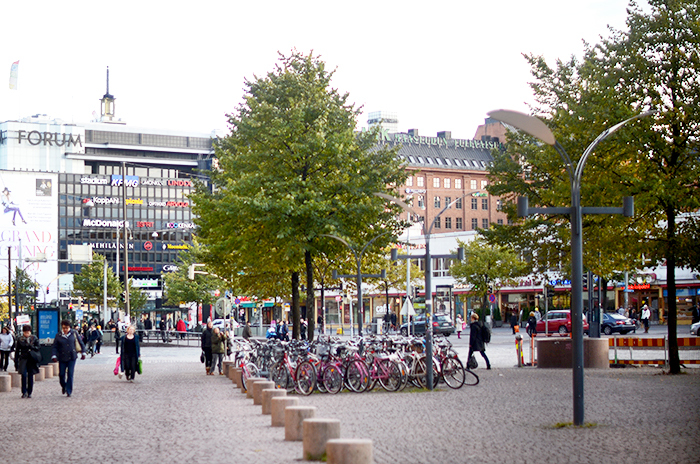 can you speak swedish and what have you been studying/ or going to study? Hugs! I can’t believe it’s fall/winter there. It’s still like 80 degrees over here. Jealous. You look very nice 😉 I like your blog. But can you tell me how tall are you? The scarf is a nice addition to this outfit. Magic! Love it so much! Are you studing anything at the moment? University? 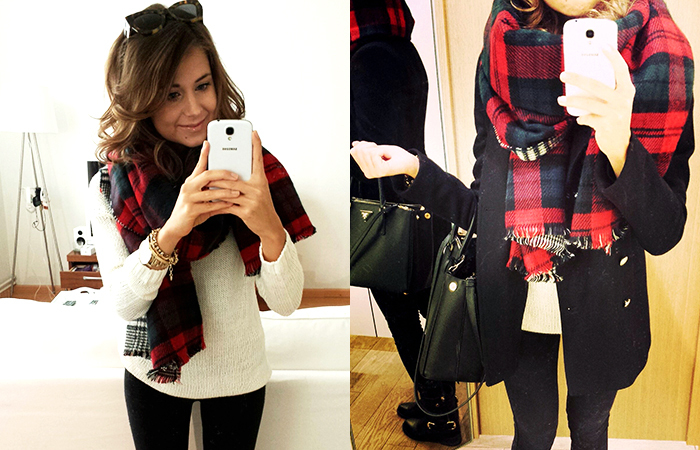 I love the very simple black and white outfit combined with a big red plaid scarf, it really pops out. Your boots are so great! So perfect for rainy weather. I love the coat you are wearing! Love the outfit! Hunny, could you tell for how much did you buy your Prada bag? You are so pretty.I realy like your blog.Best wishes Anna. 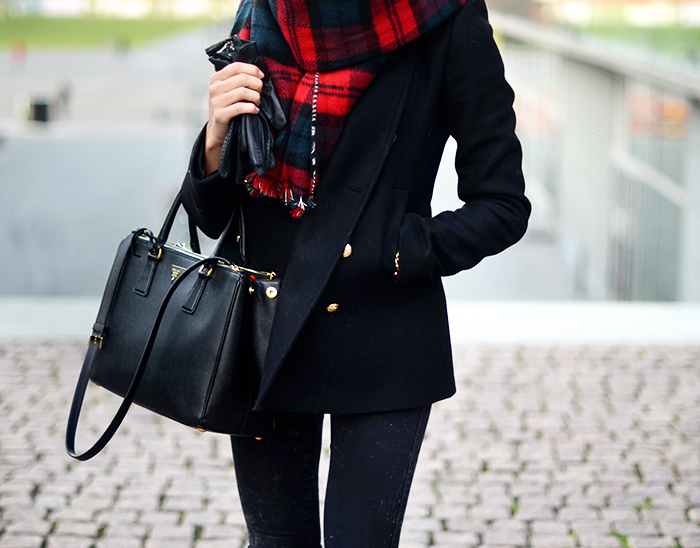 Beautiful outfit, i love plaid scarf ! I repeat the question about the jacket – is it from current collection? It’s gorgeous!! You’re outfit is amazing! Hope you’re feeling like yourself soon! I love this scarf! it’s so fashionable!!! I love your style! Anything plaid is a must for me! Love the scarf!! your hair is amazing! I feel the same after being sick, hard getting back into it! Lovely outfit, i really like the scarf! I love your bag and scarf, this look is perfect! Love your Scarf and Boots! I’ve been looking for a cute plaid scarf! Love big scarves! Makes me love fall even more! I love the new combination! The scarf is such a gorgeous touch! It seems to be working really well with leather. Love that scarf! It looks so cozy! I think you are the cutest person in the world with that huge scarf! Who knew that things that keep us from getting cold can actually look so freakin adorable! 🙂 You look amazing! lovely scarf, like the pattern! I love this outfit! an extremely classic base, a touch of color and a note of rock ‘n’ roll 🙂 apparently it looks simple, but it is studied with great care and the result is perfect. is not only fashion… it’s style!! I looked for a scarf like that for ages. You think they are still in Zara? Amazing boots, amazing coat !! Love your outfit! I have an outfit with that scarf too on my blog, check it out! I love these kind of checked scarfs! So warm and cosy, they are timeless too :). Lovely coat! is it new season? Love this…that zara coat is on my wishlist! Next time I’ll do that! 🙂 Thank you Tina! This is so so lovely, I wish I looked as effortlessly smart when I dress like this! Glad you are feeling better, I am only just recovering from flu myself, and similarly feeling lacking in energy! Oh I simply adore that scarf! I don’t like this scottish print… but the whole look is cool! Hey, the boots are from where? I can’t find them anywhere? Could you specify where you bought those boots from? I can’t find the company. Thanks! You look great! So beautiful. I love these pictures! Your scarf is lovely. Really love this scarf ! I love your blog!! I have been reading it for so long. Can you please give some tips on how you got your blog’s focused and how you stuck with it rather than get distracted by many different topics? I love the pop of colour in your scarf! I can’t wait to start dressing for fall and winter. Perfect coat! Could you say the reference number please?? Because it’s imposible to find neither on the website or in the stores! I love your scarf and the coat as well, it’s so ladylike and classy! I’m searching for that kind of shoes like forever!!! I live in The Netherlands.. Does anyone know where I can buy these?